While we welcome every opportunity to welcome you and your pet into our animal hospital, the entire veterinary medical team at Mount Laurel Animal Hospital understands that there are circumstances in which it is better for us to come to you. That's why we're happy to offer our clients the opportunity to schedule appointments for veterinary house calls. We believe in doing everything possible to safeguard your pet's comfort and well-being - including seeing them within a setting that they feel safe and assured. Inside your home, surrounded by familiar sights, smells, and people, and free of the distractions and changes to routine involved with a trip away from home, is in many cases an excellent choice. Arranging for our veterinary team to visit your home may be a beneficial arrangement to pet owners, as well. 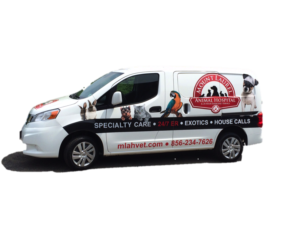 You and your pet will receive the same excellent service and compassionate care as all our patients; however, a house call appointment with Mount Laurel Animal Hospital allows you to save time by avoiding loading your pets into the car and spending time at the hospital, waiting for your pet to be ready to leave. If you're interested in making an appointment or have additional questions about house call services at Mount Laurel Animal Hospital, please call (856) 234-7626 or request an appointment online.